Now, people ask me all the time how we got four surplus budgets in a row. What new ideas did we bring to Washington? I always give a one-word answer: Arithmetic! 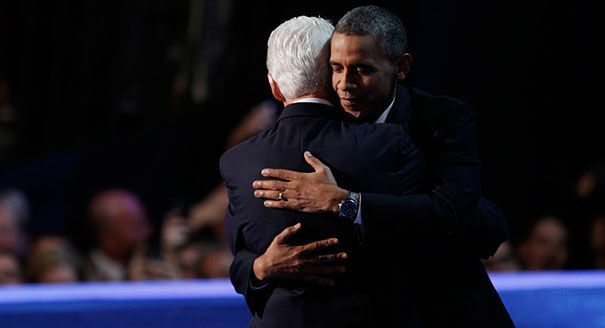 —we can put to bed the tiresome narratives about how the Obamas and Clintons hate each other. They might not be best friends, and they may never be, but they are clearly strong political allies who respect one another and know how to work effectively together, and the reductive gradeschool nattering about whether they're besties elides the powerful narrative of alliance despite differences, which is a centerpiece of the Democratic Party, its diplomatic approach, its diversity, its commitment to consensus, and its rejection of obstructionism. It is a flawed party, but it also a party that is fundamentally more decent in every conceivable way than its primary opposition, as their respective conventions have made abundantly clear. And nothing more emblematically illustrates what's right with the Democratic Party than the Obamas and the Clintons. Gabrielle Douglas leads the Pledge of Allegiance. AFL-CIO President Richard Trumka on rebuilding the middle class. Cristina Saralegui, host of the Spanish-language show, Cristina, aka the Cuban Oprah, on dreamers and the choice before Latin@s in this election. Finally! 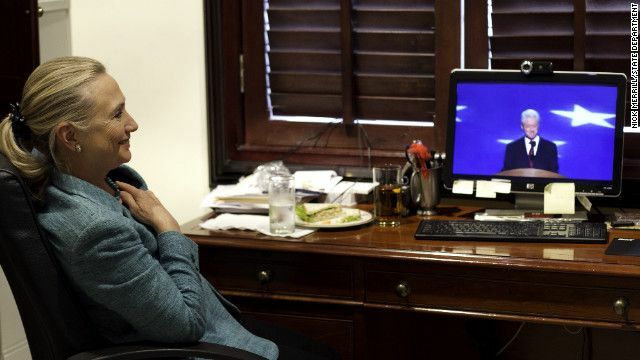 Here is a State Department photo of Hillary Clinton watching Bill's speech last night from East Timor.